Under Zambia’s Republican Constitution, the rule about a presidential term not qualifying as a full term if it spanned a period of less than 3 years, first came into existence in the 2016 amended Constitution. It arises in only two situations: (a) where the office of president falls vacant and the vice-president automatically takes over (e.g. if the incumbent dies); and (b) when an election is held because the vice-president who should take over to serve the remaining term is either unwilling or unable to do so. We can call these the “New Clauses”. Obviously neither of these situations was at play during the 2015 presidential election because these provisions were not in existence and were therefore not recognised in the law at that time. “…. _the presidential tenure of office that ran from January 25, 2015 to September 13, 2016 and straddled two constitutional regimes, cannot be considered as a full term_ “. In doing so, the Constitutional Court effectively backdated the application of the New Clauses to a time when there was already a law governing: (a) the eligibility of a person to stand again as a presidential candidate who has twice been elected as president (he or she would be disqualified); and (b) how long a presidential term needed to be in order to count as a full term under the law (there was previously no minimum period, meaning prior to the 2016 amendment to the Constitution, a person could technically be president for less than a year and still be deemed to have served a full term). To give you an example of the awkwardness of this position, imagine the Constitution being amended to raise the qualification age for presidency to 40 years from 35. Using the logic above, a president who was elected at 35 years would now be deemed to be ineligible to have stood in the earlier election based on a law that had not existed at the time. The pre-amended Constitution clearly stated that “a person who has twice been elected as President” could not run again for that office, while the amended Constitution states that a person who has “twice held office” cannot run again for that office. There is no contradiction in these two positions – the later version simply tidies up the earlier one by making clear that there also has to be a swearing in. In short, the Court decided that they should backdate the application of the three-year rule, even though it did not exist at the time of President Lungu’s first election, because of the need to clarify how this would affect a person that happened to be president in between these two constitutional regimes. 1. The idea that the first period served by the incumbent president straddled two Constitutional regimes and therefore needed some form of transitional wording is really a fabrication of a concept. The Court somehow managed to identify a problem that did not exist – the amended constitution was assented to seven months before the 2016 election. Parliament was dissolved in May, 2016 and the remaining time to the election was merely a caretaker phase as the official campaign period had already commenced and was nearing its conclusion. The president’s tenure was therefore coming to an end under the 2015 mandate which was adequately covered by the pre-amended Constitution. As we shall see later, serving even for one year constituted a full term under the pre-amended Constitution. 2. In inserting and backdating the application of a provision that was only due to come into effect after the Constitutional Amendment Bill was passed, the Constitutional Court has, in effect, usurped the power of Parliament, abrogating the fundamental rule of separation of powers. They concluded that ” _it could not have been the intention of the legislature not to provide for the period that was served and that straddled two Constitutional regimes, as to how it should be treated_ “, and then went on to decide on behalf of Parliament, which option they believe Parliament would have chosen. Raising the concern about intention is one thing; deciding which option Parliament would have taken is quite another. The Court has therefore planted into an earlier time, a provision in the law that Parliament did not on the face of it intend to come into effect until 2016 and they have done it using a set of facts that does not fit with the situation contemplated by the very provision they are relying on. For there to be justification that Parliament’s intention should be assumed by the Courts, there would have to be compelling reasons that doing nothing would result in injustice or unreasonableness. This was not the case – there would be no crisis if President Lungu was subjected to the same rule as his predecessors, namely that anything less than three years still constitutes a full term. 3. In 2015, the president was elected under the pre-amendment Constitution and was therefore subject to its provisions as they existed at the time. When the amendments were made – not too long before the campaign period had been officially opened – the logical assumption is that they would apply to future elections since they referred to a system that was planned to be introduced by the very amendments (i.e. the system of the running mate). 4. Interpreting the intention of Parliament in this way goes against the principle in law that unless expressly stated, law has no retrospective effect. As a general rule, law is not to be applied to the retrospectively unless it clearly stipulates as such. Even then, it cannot be applied to undermine rights that were available to someone before the new law existed. 5. No transitional provision was necessary in this case if the intention (as is clearly stated in the amended Constitution) was to tie the three-year rule to vice-presidents taking over from an incumbent (or any other person doing the same because the vice-president could not or chose not to stand). 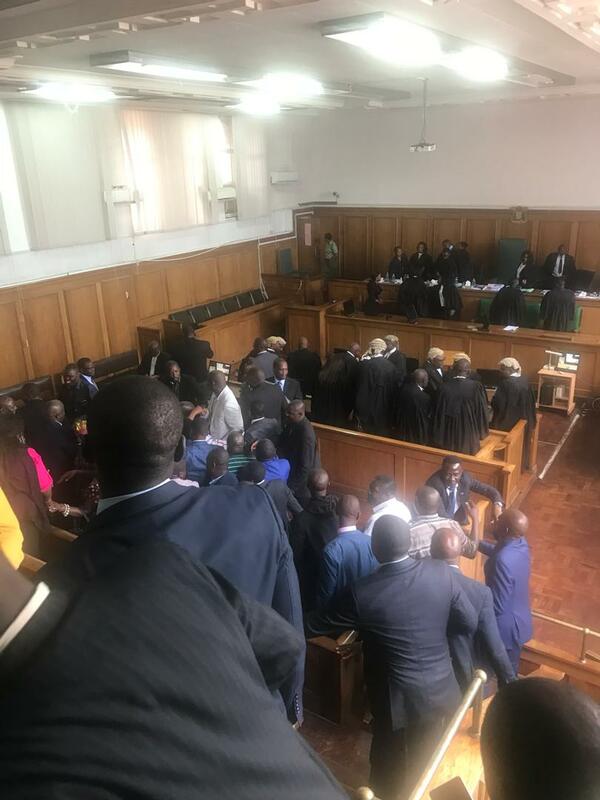 By deciding that some form of transitional provision was necessary, the Court was effectively making a decision to protect one man, President Lungu, because only he was affected by the decision of Parliament not to include any transitional provisions. This was not a new Constitution that was being presented; it was merely the same document being amended and unless the intention was clearly stated by the Legislature, there was no basis for the Court to impose an intention on Parliament. 6. Under the pre-amended Constitution, there was no such thing as a partial term. If the incumbent died two years before the next election then a fresh election would have to be held and this remaining two years would be counted as a full term. The clear intention of the legislature under the pre-amended Constitution was not to have partial terms. By introducing this new issue of a partial terms of less than three years not counting as a full term, it ought to have been clear that this was only to apply under the new dispensation – i.e. after the amended Constitution came into force and not before. Parliament would not have needed to put transitional arrangements in place to deal with such a straightforward matter. All future elections would be subject to the new provisions and all prior elections would be subject to the old provisions. 7. The facts that would need to be present to support the retrospective application of the minimum three-year term rule are absent: in 2015, there was no automatic process for any vice-president to take over and the election was held, not because there was a vacancy or because of any incapacity of the vice-president. The election in September 2015 was held because the Constitution at the time required an election to be held within 90 days whenever there was a vacancy in the office of the president. The indisputable fact is that the person whose term of office started on 25 January 2015 did not ascend to the office of President because he was vice-president or as a result of an election held because the then vice-president could not, for any reason, assume the office of President. There was no need for the Constitutional Court to assume that Parliament overlooked the need for transitional provisions regarding the issue of term of office. In doing so, the Court has probably overstepped its jurisdiction and granted rights to an incumbent president that were not given to him by Parliament. Although in their judgment they try to distance themselves from making this an issue about President Lungu, their decision makes it precisely that because he is the only one that will acquire a new right as a result of their assumption of what they believe Parliament would have done if they had applied their minds to it. This is a matter that can be taken up in the High Court as it is not premised on the interpretation of the Constitution but is a jurisprudential issue concerning the separation of powers and the powers the Constitutional Court has given itself to address a problem that never existed in the first place.